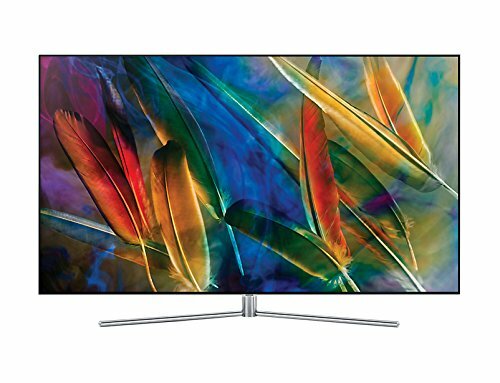 Excellent colour and HDR handling is let down only by the single side edge illumination which can show its weakness in some extreme dark/light scenes, but overall this is an excellent connected TV that offers plenty to delight. It's a little expensive, however, compared to Samsung's 2016 models which it incrementally betters. The flagship 2017 Samsung TVs carry the QLED name, a new branding for the company's top-tier tellies. QLED has been called many things, but there are two important things to consider: firstly, QLED is the third-generation of Quantum Dot; secondly the naming is really there to resonate with customers. Although the technology in the TV is enhanced over previous years (and some similar rivals), it's not a new tech. Instead it's one aiming to compete with OLED in the premium TV stakes, which is where this Samsung is pitched. The Q7F sits just down from the true flagship, the Q9F, but offers much the same experience: it's fully connected, fully featured, and a fully worth your attention. Samsung continues the idea of 360 design with the Q7F. This is a TV that looks great from the back as well as the front. Sculpting to the top and sides appear to give the TV a slim look, while the whole of the back is a striated textured plastic. The advantage this offers over smooth plastic is it doesn't look as dirty. Should you have your TV standing in a location where you can look at the back of it, it will always look clean, whereas TVs have a habit of attracting a lot of dust to their back surfaces, even if this surface still clings onto fingerprint grease. The screen is framed with a simple chrome strip around the edges for a premium look, something that's also carried into the stand design. Following the lead of Sony, Samsung is now also offering hidden cable routing - not that this Samsung really needs it in the way that many TVs do. As with the 2015 and 2016 flagships, the brains of this TV is the in the separate One Connect box. As all inputs connect to that, the only wires you need to run to the TV are the power cable and the new Invisible Connection cable. Both of these connect to the bottom rear of the TV and can be hidden with a cover. Some of the stand options, like the standard pedestal, can also accommodate these cables, so they aren't left draped over surrounding areas. Samsung has created a range of stand options, as well as a bespoke wall mount for this TV, alongside a standard Vesa mounting option. You can use a standard TV wall mount which you might already have, or you can use Samsung's own mount designed to get the TV as close to the wall as possible. The advantage that Samsung's mount offers is that it's designed to fit right into the back of the TV, whereas many Vesa mounts have a stand-off, meaning a larger gap between TV and wall. As there are no cables to worry about with the QLED models, option for Samsung's mount potentially gives you a much cleaner solution, even if it does cost an extra £129. There's one problem: the fairly short length of included power cable. This is coloured off-white which potentially matches most people's décor, but unless you've mounted the TV close to a socket, it simply won't reach. All said, the Q7F is nicely designed. Although there's minimal bezel around the display, but it doesn't quite have the wow factor of LG's picture-on-glass design for its OLED TVs. Initially setting up Samsung's new QLED TV couldn't really be easier. The stand attaches simply if that's what you're going to use and you then only need to connect the power cable and the Invisible Cable. This Invisible Cable is so-called because it's essentially a translucent optical cable, meaning that if you are wall mounting, it's just this thin cable that you need to hide. This, unlike the power cable, comes with decent length (there are 5m or 15m options) and you practically can't see it from across the room if it's hanging down the wall. The Invisible Cable is all you need to connect to the One Connect box. Like previous years, this has all the wired connections for this TV. It also now has to be powered independently, so this is a TV that needs two plug sockets before you add any peripherals. The One Connect box offers four HDMI, all of which support the latest Ultra HD and HDR standards, one used for ARC. There are aerial connections and a satellite connection (no pass-through), alongside three USB connections (all USB 2.0, one rated at 1A and designed for HDD connection), Ethernet for physical network connection, and optical for audio. The TV offers Wi-Fi for network connection too, as well as wider connection to other devices like smartphones. It favours Samsung's own phones, but offers connected apps for Apple and other Android devices. Experience says that opting for the Ethernet connection is the better choice, resulting in much more stable connections - we found the Wi-Fi to be a little temperamental and suspect it was causing our router to crash. Samsung's new QLED TVs all come equipped with a new smart remote. There's a wonderfully premium feel to this remote, with its metal finish and compact dimensions. There's no gimmickry in terms of motion control, instead you're presented with minimal buttons. That keeps things tidy, offering you home, volume, channel, a four-way controller and OK button, plus a couple of other universal buttons, like back. We've not always been fans of this smart remote system, because it assumes that minimal controls will do everything you might want to - but if you feel the same then there's a fully buttoned remote also included in the box, giving you access to everything, but minus that premium feel. The thing that Samsung is pushing to ease away the pain point of having no buttons on the smart remote is universal device recognition. When you connect a new device to your TV, the Q7F goes off to identify it and opens up a connection wizard to take you through the process. The idea is that you connect, for example, a BT YouView box, and the TV sees it, asks you to confirm what it is and then guides you to testing the remote's controls. That not only sets up the remote, but identifies the device in the sources list and in some cases, pulls information into the TV's Tizen user interface. This is where things get more interesting, because you can then have, for example, those TV channels from the connected BT YouView box appearing as shortcuts in the TV's interface when you press the home button. This is really a measure to counter the TV becoming just a display while your connected devices take over the interface, making Samsung redundant. The same method is used for apps like Netflix: recent programmes are displayed so you can immediately resume what you were watching. The downside to this whole system is that the TV really doesn't like it if it doesn't know what is attached. You can't connect something to HDMI and just get the TV to switch inputs. It wants to run through the connection wizard for each device. If that wizard doesn't identify the connected device or you can't get the remote setup, you're essentially forced to lie to the TV and say it's all fine before it will let you watch that device. We connected a Blu-ray player and after some time trying to setup the remote, we decided it was too long and basically just had to say it was working when it wasn't, just so we could watch that input. One thing that Samsung offers to make general access to the TV easier is voice control. This is via a button the remote control, letting you press the button and then say just about anything you like. That might be to launch an app like Netflix, to search for content or to change a particular setting. Like Samsung's Bixby, voice designed to make interaction easier, although it's not fully universal. While it will launch Netflix, it won't control it; while it will search for content, it's only on YouTube; while it will attempt to change the channel on a connected set-top box, it doesn't always get the right one - neither is it completely savvy with the channels from its own tuner. For example, having setup the TV with a YouView box as detailed above, asking to "watch BBC One" by voice control sees the request recognised, but not always executed. We were offered the BBC red button channel, BBC Two and BBC Two HD, but not BBC One. Voice can be mastered, however. If you know the channel numbers "watch 105" then the performance is flawless, but that makes it feel essentially gimmicky - plus you have to press a button to activate voice, so you might as well just use the remote that in your hand to do what you want instead. Samsung has talked up QLED a lot since launch. The message is about delivering wonderful colours (high colour volume as Samsung calls it) thanks to the enhancements to the Quantum Dot layer, increased contrast and the most impactful high dynamic range (HDR), thanks to the 1500-nits brightness this TV can achieve. The Samsung Q7F is an edge-lit LED panel and those LEDs are arrayed across the bottom of the display. It then has dimming blocks to control the spread of light across the display. This is really where it differs from the Q9F which has LEDs top and bottom and greater control of the light on the display and how it is used. However, even without the hardware advantages that the Q9F offers, the Q7F offers wonderful quality. It offers realistic colours throughout the spectrum, it offers brilliant clean whites and deep blacks. The best quality is reserved for Ultra HD and that HDR content - which looks exceptional. HDR has punch when coming from a native source, like Netflix. Jessica Jones not only offers great visuals, but some of the noise that's common to a lot of streaming content at top quality levels if deftly handled by the TV, leaving you with glorious HDR imagery. Ultra HD Blu-ray has the edge, however, delivering solid visuals for the very best Ultra HD and HDR experience. Blu-ray is equally well served with detail and clarity. There's no Dolby Vision support from Samsung, but the company is pushing a new standard with dynamic metadata called HDR10+. We're yet to see this in action, but Amazon Video has announced support, so we should see more enhanced visuals in late 2017. Samsung very much wants you to leave the picture settings alone on this TV. It's been designed to work optimally out of the box, without needing you to alter the brightness or backlight. For quality HDR sources that rings true and we're impressed with the out-of-the-box experience in these cases, where the source controls the display's output. As the quality of the source drops, there's the temptation to swing in and make alterations to get the type of picture you want. On lower quality sources, such as SD broadcast TV or streams like Now TV or All4, we found that with the contrast enhancement set to high that some shadow detail could be crushed, while other areas of colour get the pop you want. Turn off the contrast enhancer and shadow detail will return, while highlights can lose their bite. It's here that striking a balance on contrast and tweaking the gamma to help brightness can improve the picture. Part of Samsung's control comes from a built-in light sensor that's aiming to detect the room's lighting and make changes to the TV's backlight to suit. That should avoid previous complaints about needing different settings based on the time of day, to reduce the backlight in the evening, for example, due to it being so bright. The ambient light sensor controls live in the eco settings in the "general" section. It's worth looking at, too, because you can set a minimum backlight brightness - so if you've blacked out the room and feel the TV is dimming too much, you can change this setting. Note that this is separate from power saving options, it's specifically about adapting the backlight for the room. However, we also noticed that brightness was sometimes changing within scenes, when one character was in shadow and the other in bright conditions, which we assume is because the bright scene was illuminating the room more. Switching off the ambient sensor seems to solve this. It's in dark scenes where you'll notice the effect of that bottom edge illumination and see where this TV is weaker than OLED equivalents in the same conditions. Take a scene where you have mostly darkness and one bright point - perhaps credits or backlit subjects - and you'll see the screen lighten around the width of that highlight from the bottom, spreading up. OLED, as it emits the light from the pixels themselves rather than having to manage the light path from a source at the edge, will give you that clean credit in an ocean of black with more impact. That has an impact on letterboxing bars too: in dark scenes changing from light to dark, you'll notice that the black bars top and bottom can change brightness too. That's not something that blights regular watching, with rapidly changing scenes, full of colour and so on. And that's where Samsung's QLED TVs triumph over OLED: while OLED TVs are getting brighter, they can't match the punch that this Samsung TV will put out. It's proper smack-you-in the-face with a colour punch when HDR swings into full effect. It's visually staggering. Viewing angles are pretty good, too, but you will notice a drop in contrast as you move to a more extreme angle away from the centre point. If you're in the unfortunate position of having to watch the TV from that corner chair that's at 90-degrees to the screen, then it's a problem, but on the whole, in a regular setup with the sofa in front of this TV mounted at the right height, viewing angles are perfectly acceptable. The Samsung Q7F's onboard speakers are reasonable too, certainly adequate for anyone after a general TV watching experience. They don't give you any subtlety or sophistication when it comes to presenting a wider sound stage, so they're not great if you're planning to listen to music, for loud gaming or if you spend most of your time watching movies. Samsung's QLED adventure takes a step up over its flagship SUHD TVs from 2016. The interface is simplified, lightning fast and easy to use. The connectivity is good and the One Connect box is practical to keep everything looking cleaner. The choice of stands and bespoke mounts give you options, with that neat Invisible Connection cable allowing for a neat installation - as long as you can accommodate that short power cable. Samsung's smart TV features give you all the apps and services you'll need, offering plenty of 4K HDR content from a variety of subscription services and negating the need for other devices in many cases. Those devices you do connect get smartly setup and controlled by the smart remote, although that process might irk some. The screen's performance is excellent with HDR getting all the glory with wonderful impactful colours and great highs. There's skill in handling blacks and plenty of contrast, although the single edge illumination can lead to some light bleed in extreme dark/light scenes. Lower quality content can struggle to pull out darker detail, but you do have options to edit the settings on each input to suit your preferences. Overall, there's plenty to keep you entertained with the Q7F as the centre of your home. Perhaps the only stumbling block is the price: at £2,299 for the 55-inch model on review here, you can get last year's excellent KS8000 in 55-inches for about £800 less. The Q7F is a great TV, but it seems that moving to the QLED branding has also jacked the price up too. Time is a double edged sword in TV ownership, but the falling price of LG's "entry-level" OLED TV makes it a realistic proposition for anyone looking for a premium smart TV. OLED technology has some distinct advantages when it comes to illumination of dark scenes and excellent viewing angles. This is a very refined package, but perhaps the most appealing thing is that you can now get this OLED TV at 55-inches for under £1600. Downsides are that the HDR delivery doesn't quite have the punch and this TV has all the connections on the back, meaning cables everywhere. Samsung's QLED TVs now sit in a category above the SUHD TVs of 2016, but there's no getting away from the fact that the new models are very much an evolution of last year. That poses something of a problem, because you can get yourself a TV that's almost as well connected and almost as capable, but for a lot less money. The KS8000 is a great TV and wonderfully capable. It suffers some of the same shortcomings as the Q7F in dealing with extreme dark/light scenes. You don't get the latest smart remote with voice control or the Invisible Connection, but you still get a cracker of a TV, with a 55-incher costing you around £1400.